I again apologize for my tardiness in reporting these roost counts to you. This year has been a funny one that has been full of unexpected changes both large and small, leading to making several adjustments. With luck, we should now be on track and the remaining year should be uneventful as well as punctual! 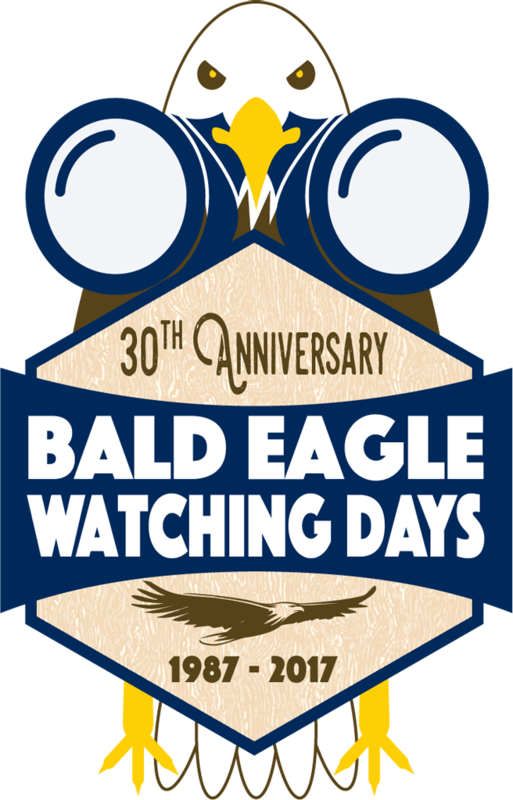 On January 1, 2017, count you collectively tallied 74 eagles through 34 volunteer hours invested (Table). Thank you all very much for your efforts. Your dedication, even though trials of cold and life events have collided with counts, you have all persevered. Our counts are still quite low compared to other years at this time (Figure 1) but there is more winter to come hopefully. If more eagles do not migrate to the Sauk Prairie Area we will be faced with one of the lowest winter counts in 20 years (Figure 2). Time shall tell. Since I last wrote to you we did receive the results that John Lyons found from sampling fish on the Lower Wisconsin River. In the past, we used John’s fish data captured from Prairie du Sac to Spring Green to compare with maximum eagle numbers that FBEC counted from Prairie du Sac to Lone Rock and found a significant relationship (Figure 3). Figure 3 include data from 1999 to 2008 – 10 years of data. John has continued to sample fish since that time and is still willing to work with us so I will let you know when I update this graph with another decade of data. 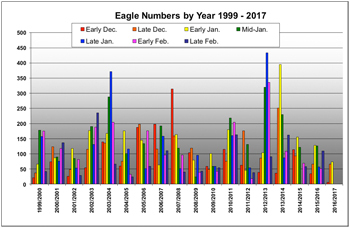 For the purpose of comparing our low eagle numbers so far this year, the lowest maximum count of eagles 1999-2008 was 118 individuals (Figure 3), well about our highest tally so far of 74 eagles. 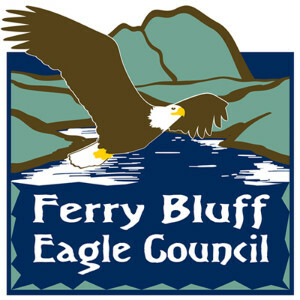 Of course, the winter is not yet complete so our maximum number of eagles for this winter is not yet known. 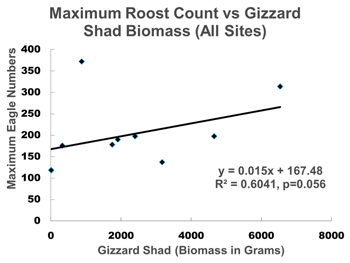 The biomass of Gizzard Shad that John found in the Lower Wisconsin River in summer, 2016 was 4,495 g, a rather high biomass estimate for Gizzard Shad. Of note, however, of this total biomass, 4,115 g (92%) was measured in Prairie du Sac, an area that eagles have not yet used this winter. Few Gizzard Shad were sampled near Arena or near Spring Green. 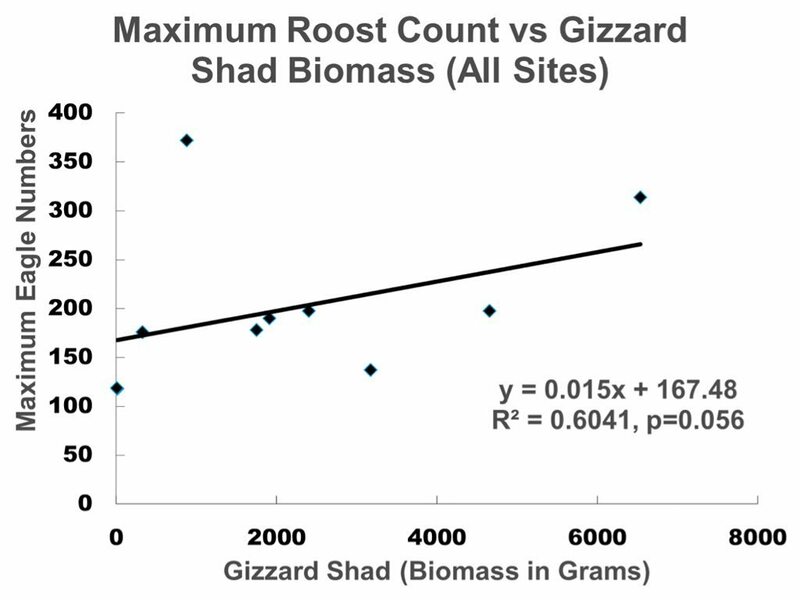 In Figure 3 the model (the line) would predict that, with 4,495 g of Gizzard Shad in the Lower Wisconsin River we would expect to have a maximum count of 225 eagles this winter. We are a ways from that tally! Certainly, other things may come into play. Perhaps Gizzard Shad are not the only important fish species for wintering eagles to eat. Perhaps fish biomass is not the only important factor for eagle numbers. Where the fish are may matter and may interact with where ice is. The story is far from told as of yet. There is more to say on this subject but, in the interest of getting these results out to you before Bald Eagle Watching Days, I will leave things open. Stay tuned, keep counting and thank you for your efforts! Figure 1. 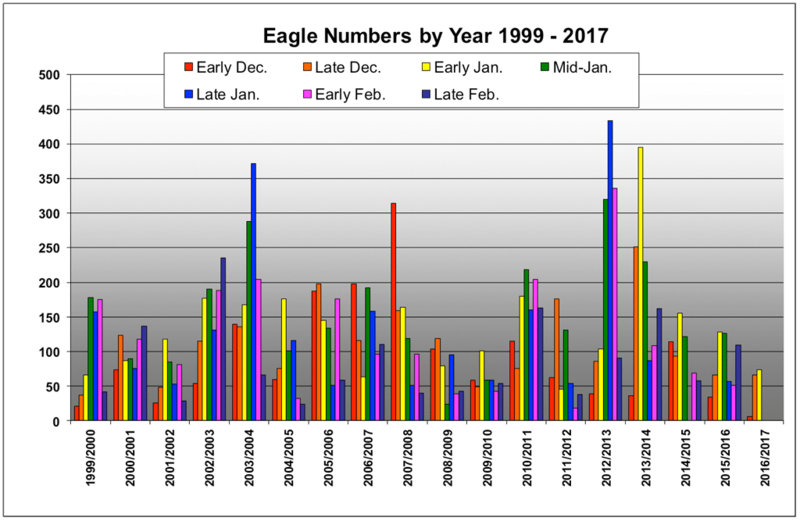 Coordinated eagle count results for 7 counts conducted each winter in the Sauk Prairie area 1999 – 2017. Table. 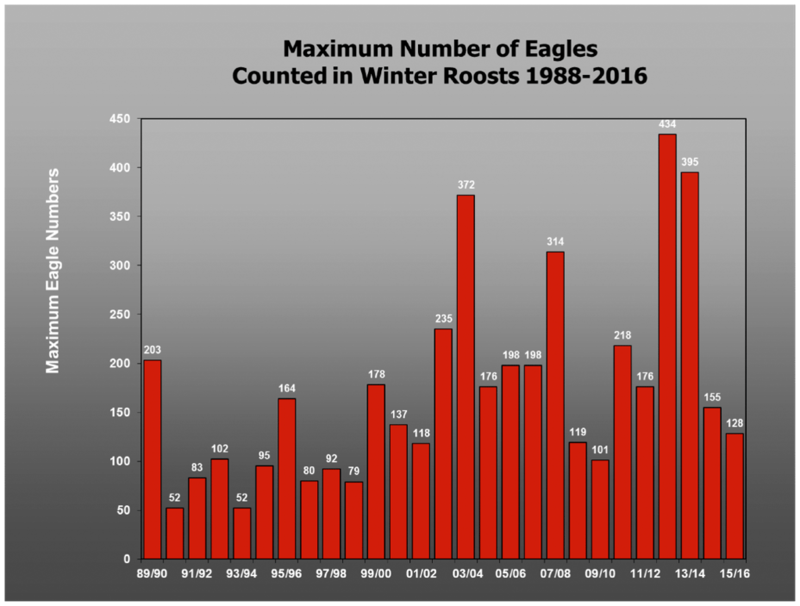 Coordinated roost count results for the winter of 2016/2017 by roost. Figure 2. 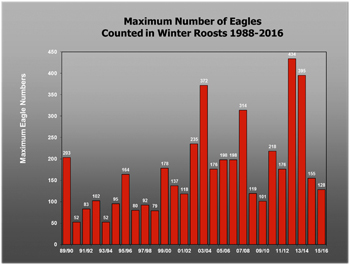 Maximum number of eagles counted each winter in the Sauk Prairie region 1988 – 2016. Figure 3. 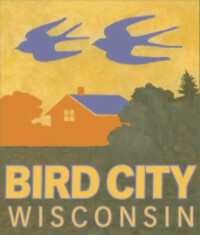 Maximum count of wintering eagles from Prairie du Sac to Lone Rock compared to total biomass of Gizzard Shad captured during the previous summer from Prairie du Sac to Spring Green, 1999-2008. Fish data from John Lyons, WI DNR.